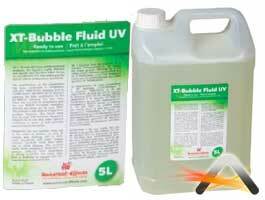 Universal-Effects Bubbles Fluid is a new and exceptional formulation. It is manufactured with high quality ingredients used in cosmetology under the "Hypoallergenic" label and is high yielding on all types of machines. Rediscover your bubbles machines ! Reacts in Ultraviolet ray (Black Light).